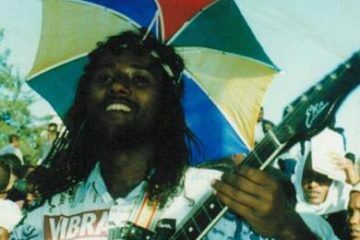 Photo (Left) Mintwab Mukulo. 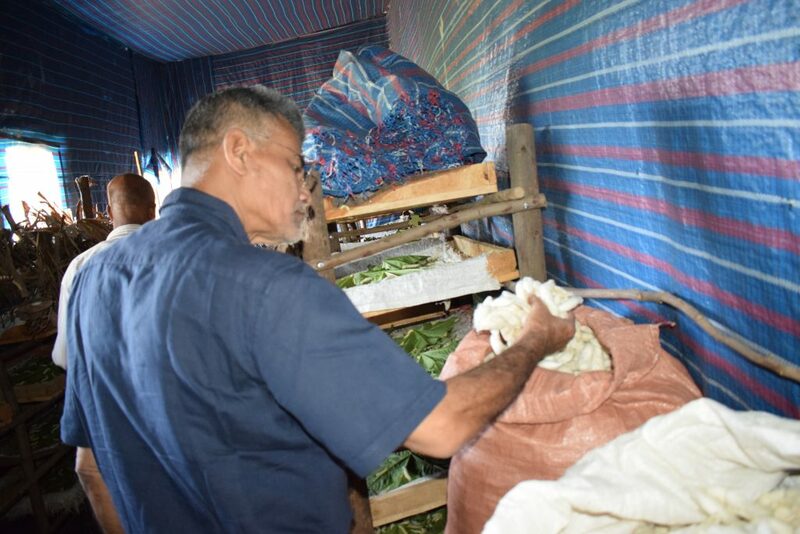 (Right) Members of the Abenezer Silkworm growers’ enterprise at work – Mitiku Denbel, Aynalem Choke and Samrawit Chernet drying fresh cocoons using sunlight. 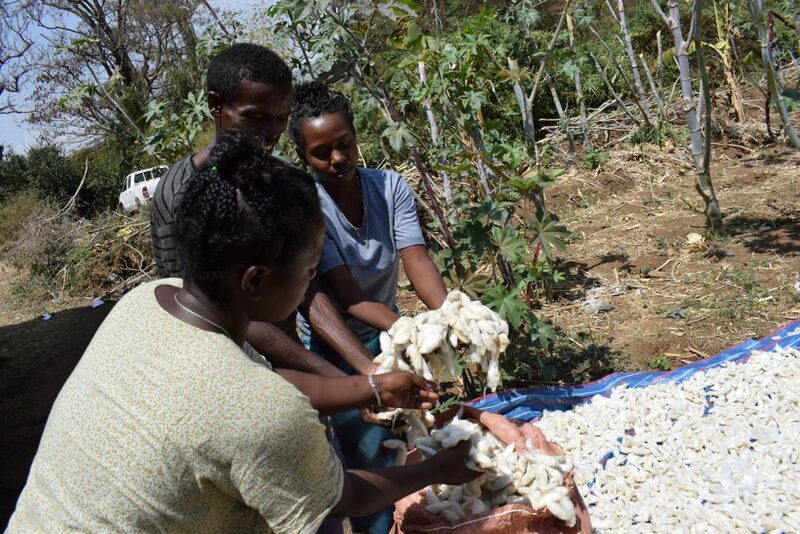 Organized youth enterprises and women groups produced over 2,000kg of Eri silkworm cocoons from which they generated income about ETB200,000 (»US$7,000) in Arba Minch and Mirab Abaya Woredas of the YESH Project. Incredible opportunities created for 2,500 unemployed youth in the Southern Nations, Nationalities and Peoples Regional State of Ethiopia through silkworm farming by the Young Entrepreneurship in Silk and Honey (YESH) project of the icipe. 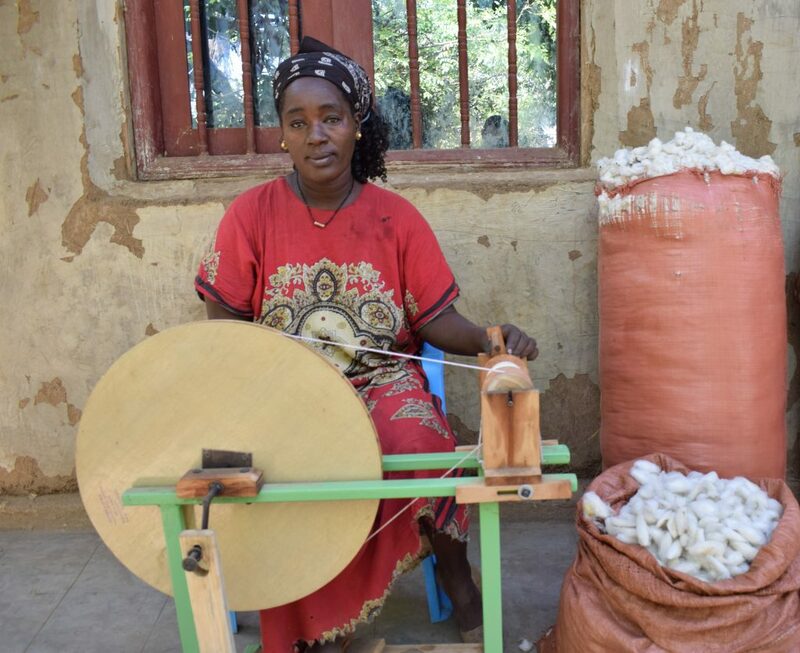 Addis Abeba, April 10/2019 – This is a new chapter in sericulture development in Ethiopia. Silkworm farming had been piloted and promoted by smallholder farmers and enterprises in different parts of the country, but the focus was on Mulberry Silkworm production. Weak market linkages and limitations in knowledge and skills constrained progress for some time. The YESH Project led to shift in focus to the more adaptable and resilient Eri silkworm production, and tried to systematically address known knowledge and skills gaps, promoted dedicated land and rearing sheds for commercial production and encouraged local market linkages. Project beneficiaries and extension staff are joining hands to the uplift performance of the sericulture sub-sector not only as an economically viable and environmentally friendly source of good income but also as a source of decent employment for unemployed youth and women. How did this take place? By introducing and promoting inclusive and market orientated Eri Silkworm production agri-business with scope for expansion and upscaling. The YESH project seeks to create 2,500 direct and many more indirect jobs to youth and women beneficiaries by providing the necessary technical support to start commercial silkworm production. This includes delivery of a series of trainings (technical, entrepreneurship, financial management and marketing), facilitation of the formation of youth silkworm farming enterprises, ensuring that the business is established on a dedicated cultivated land for production Eri silkworm feed and building of rearing sheds and dissemination of the starter kit (rearing trays, beds, mountages, spinning machines). The project also supports the establishment of sericulture marketplaces to serve needs for demonstration, training and marketing of inputs and outputs. Chano Mille and Ugayehu are two of the many villages the project has been underway for the last three years. The progress that two of the project beneficiaries have made so far demonstrate what can be achieved at scale when development support combined with the support of local institutions meets the genuine interest of needy communities. Members of the Abenezer Silkworm growers’ enterprise at work – Mitiku Denbel, Aynalem Choke and Samrawit Chernet drying fresh cocoons using sunlight. Abenezer Silkworm growers’ enterprise is one of the 120 youth enterprises the project has helped establish so far. They operate in Chano Millie village of Gamo Zone. As a group, they foresee a hopeful future in this business. They acquired skills and know-how in rearing silkworms. Apart from making attractive incomes from production and sale of raw cocoons, they are engaged in a small side business, like growing vegetables (tomato, pepper, onion) to complement their income as well as make wise use of available labor and land at their disposal. This hopeful feeling is shared widely by many other such project beneficiaries. The happy charming faces of the youth at the sites are the first indication of the positive contributions of the project in the livelihoods. Nowadays, silkworm farming is being picked up by non-beneficiary farmers and over time sericulture will become the engine of economic and social change in the villages. They can send their children to school, build better houses and expand their business. The YESH project is at the heart of this rural transformation. Only in 2018, they produced over 2,000kg of silkworm cocoons. At the local market, 1kg of cocoon sells for ETB100, which equivalent to about US$3.50, and with improved quality of cocoons and large volume for sale, there are opportunities for export as well as local processing and value addition to cocoons for even better incomes. This further boosts the local economy. The Government of Ethiopia and development partners are taking notice of this opportunity. On 11 February 2019, a team of experts from International Trade Center and FABRIC PLUS of India paid an official visit to the project’s sericulture sites in Arba Minch and Mirab (West) Abaya Woredas. The objective was to assess progress, share experiences and to explore areas of collaboration. The visiting team met with silkworm growers and were inspired by their performance in doing the business. “I looked closely at the shapes and the size of cocoons the youth and women have produced. Fortunately, all those cocoons are the best quality. They know how to make money in the silkworm farming business. What I admire about the implementation of the project is, its approaches linking the large pool of unemployed youth with such wealth of opportunities”, said Dilip Baroah, Eri expert from FABRIC PLUS of India. Cocoons ready for sale (left); Samrawit Chernet (right) mounting mature silkworms in Chano Mille village.